Below is Written by Jackie 137, Edited by Happy Labs. Q: How do I increase the number and type of shoppers coming to my mall? A: Complete investments that appear after certain shops are built. The reward of some investments will introduce a new item, hence a new type of shopper and a 2 person increase in your total number of shoppers. Note: Shoppers will always be drawn to your mall so it's best to get the highest number of shoppers that you can by making investments ASAP. Q: How do I increase the spending power of my shoppers? A: By using items on shoppers or building ATMs (lv 16 required). You can buy items from Item Shop. In general, when shoppers need money, they head over to an ATM. The higher the level of an ATM, the more coins they get. Q: How many shops do my shoppers visit before they leave my mall? A: Shoppers will visit 3 to 6 shops before they leave. They will leave early if they run out of coins or get impatient. Q: What does "too slow" or "can't wait any more" mean? A: This means that your shopper has spent too much time waiting at a particular shop i.e. the queue is too long. Build another one of the shop or move it to a higher floor. The higher the floor, the lower the demand. As in real life, shoppers prefer shops on lower floors e.g. shops on Floor 6 will have a lower demand than shops on Floor 1. If your shopper gets impatient, you will lose revenue. At the minimum, if they still have coins to spend, each shopper will visit 3 shops before leaving. One lost visit equates to one less chance of getting coins. For example, if your shopper has waited too long at his third shop, he will not go to a fourth shop. Q: How do I increase the max coins of my shoppers? A: Select a shopper from the game board or through the information counter and then "use item" . Q: How do I increase the usage fee of my shops? 2. Put decorations adjacent to your shop. Each decoration adjacent to your shop increases it's usage fee by 1. The more decorations strategically placed, the higher the usage fee. The cost of the decoration doesn't impact the usage fee of a shop. Tip: all shops have their own characteristics e.g. shoppers spend more time in certain shops than others, some can cater for multiple shoppers etc. For example, shoppers spend more time in the Sportswear Shop as it takes time to go in the dressing room, change, come out and pay. Pay attention to each different shop and design your mall accordingly. Q: Why is my shop 'inaccessible'? A: Your shop must have a clear path to the exit. If not, shoppers will not be able to enter the shop. It shouldn't be blocked by other shops or decos. A: Use items to increase the usage fee and appeal of your shops and the spending power / max coins of your shoppers. For shoppers, each item used increases their spending power by 5 coins. For shops, in general, the first 3 of any items used will be "effective". After the first 3, their effectiveness is random. Each type of shop has 1 or 2 items that are "super effective". Q: How do I earn more diamonds? Collecting stars and helping lost shoppers to activate the "fever mode". 1 in 3 fever modes will yield a diamond. Q: What is the benefit of making an investment? A: Each investment has a reward. There are a few types of rewards e.g. a new item, a new floor or specials like auto coin collect. Note: A new item also introduces a new type of shopper and increases the total number of shoppers that will visit your mall. Q: How do I expand floor? A: Talk to info counter to expand floor. Q: How do I add a new floor? A: Complete investments and it'll soon turn up in Tasks as a reward. Q: Is there an auto collect coins feature? A: Yes. Keep on playing and making investments and it'll soon turn up as a reward. Note: the auto collect means that all your coins will be collected at a simple tap of a button. It does NOT mean that the game will collect your coins for you. You need to put in the effort and time to accumulate coins. Q: How do I move a shop from floor to floor? A: Put your shop in inventory, go to the desired floor and take it out. Q: How do I put a shop in inventory? A: Select the shop, click the "info" button and then "store". Q: Why can't I find my friend? A: Game IDs are made out of alphanumeric characters and are case sensitive so watch the capitalisations and numbers e.g. I, l, i, L, 1, B, 8, o, O, 0. Q: How do I get more friends? A: There are always players advertising their Game IDs on the Happy Mall Story FB page so look out for them or advertise your mall there. Or get onto the "rankings" board. New players often follow people who are on the board. A: Click on the "Social" icon. Q: How do I make coins quickly? A: Maximise the efficiency of your mall. The aim is to get coins from your shoppers as fast as possible. Fewer, more expensive shops is more efficient than many cheap shops. Make sure your shoppers have enough coins to spend at 3 shops. Make investments as fast as you can as it usually increases your total number of shoppers. The more shoppers you have coming to the mall, the higher your income. Q: Why do you let cheaters remain on the rankings board? A: Time and resource constraints makes it hard for us to monitor the board. We do check it when possible. When found, cheaters are banned from the board. Q: What is Game ID for? A: Game ID is how our system save your data and recognise your game so you absolutely need to note it down somewhere. You also need it to add friends. Q: Why can't I get online in the game even though I'm on WIFI? Why can’t I get game ID or go to leaderboard even though I'm on WIFI? A: If you are on Android, please send us HappyMallStory.id from your SD card. We will help you to get connected. Q: Why did my game restart to level 1? I changed phone and I lost my account? 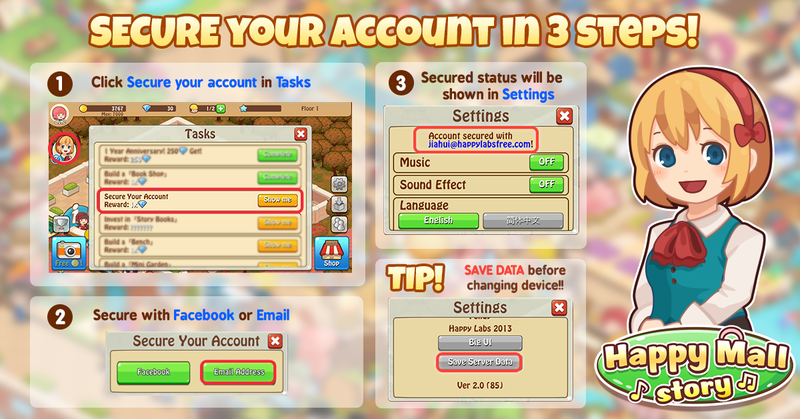 A: Send us your old and new Game ID and we'll help you to retrieve your data as soon as we can. Q: I don’t know what’s my old ID. Q: I'm on Android and I can't download your game! Q: The game keeps crashing! A: Please make sure u have enough memory and space in both your phone and SD card.